Home » tech news » Mark Zuckerberg and wife Priscilla Chan give their daughter the cutest name ever! 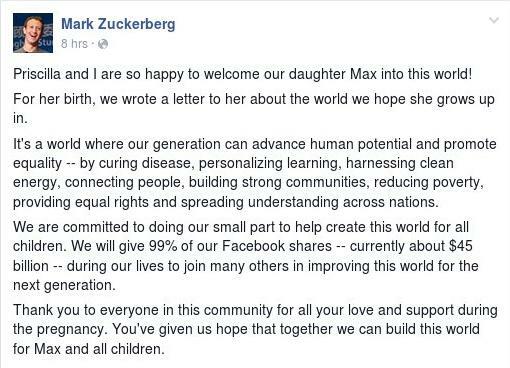 One baby filling up the news feed today is Maxima Chan Zuckerberg. Facebook CEO Mark Zuckerberg, in a post on Tuesday, announced the birth of his new born daughter Maxima with wife Dr Priscilla Chan. Not only this, he also shared a cute photograph of him and Priscilla holding the baby. "Max, we love you and feel a great responsibility to leave the world a better place for you and all children," Zuckerberg and Chan said in letter to their daughter, which they posted on Facebook on Tuesday. "We wish you a life filled with the same love, hope and joy you give us. We can't wait to see what you bring to this world."